According to a report from the Congressional Research Service (CRS), the share of oil and natural gas production on federal lands has dropped significantly from their highs in fiscal year 2009. The share of crude oil on federal lands dropped to 23.7 percent in fiscal year 2017 from 35.7 percent in fiscal year 2009. The share of natural gas production on federal lands dropped to 13 percent in fiscal year 2017 from 25.2 percent in fiscal year 2009. Production on federal lands has not been able to fully recover from Obama Administration policies that resulted in a moratorium on offshore energy permitting and long delays in approving drilling permits. In contrast, oil production on private and state lands in fiscal year 2017 was 108-percent higher than in fiscal year 2009 and natural gas production on private and state lands in fiscal year 2017 was 48-percent higher than in fiscal year 2009. Production of oil and natural gas on non-federal lands is skyrocketing as hydraulic fracturing and horizontal drilling have increased production dramatically. These are enormous differences in outcomes between federal and non-federal lands and waters. If more oil and gas production is a good thing for the United States, the Obama Administration’s policies on federal lands and waters are a lesson in what not to do. Natural gas production on federal lands has been declining since fiscal year 2007. Natural gas production on non-federal lands, in contrast, has been steadily increasing. 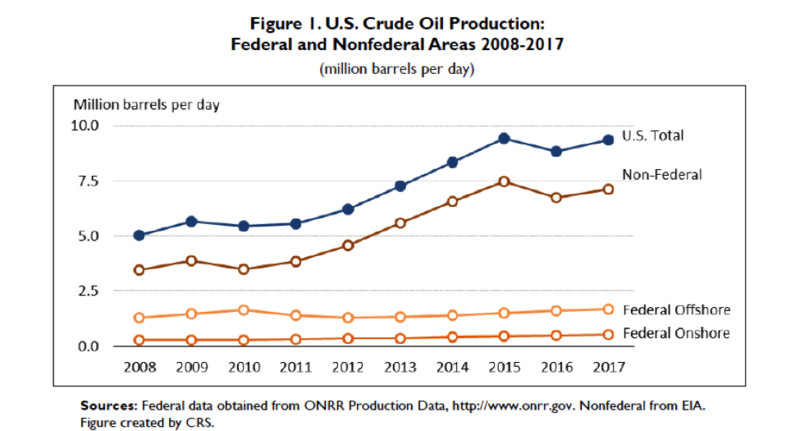 Looking at a time trend of historical production data provides an even more dramatic indication that Obama Administration policies hurt oil and gas production on federal lands, while oil and gas production on non-federal lands skyrocketed. Between fiscal years 2009 and 2017, crude oil production on state and private lands increased by 3.7 million barrels per day, an amount which is more than each of the following oil producing nations—Algeria, Libya, Angola, Nigeria, Kuwait, Venezuela, Columbia, Brazil, Mexico, Qatar, and Norway—produced in 2017. 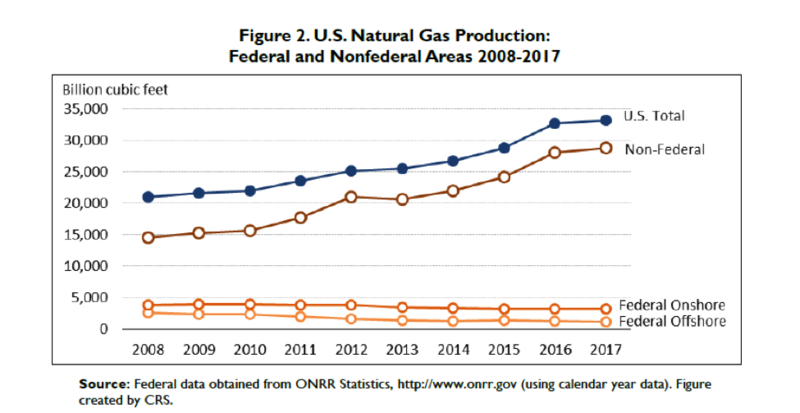 Likewise, natural gas production on federal lands, both onshore and offshore, has generally decreased, while natural gas production on non-federal lands has steadily increased. The Obama Administration increased permit waiting times to drill on federal lands, driving oil and gas companies to private and state lands to make their investments. After a company has obtained a lease, it must also obtain an application for permits to drill (APD) for each oil and gas well. Despite the Energy Policy Act of 2005 providing a new improved timeline for review, it took an average of 307 days to approve or deny an APD in fiscal year 2011, 89 days more than the 218 days it took in fiscal year 2006—41-percent more time. In its budget justifications during the Obama Administration, the Bureau of Land Management indicated that overall processing times per APD increased because of the complexity of the process, a process they themselves control. 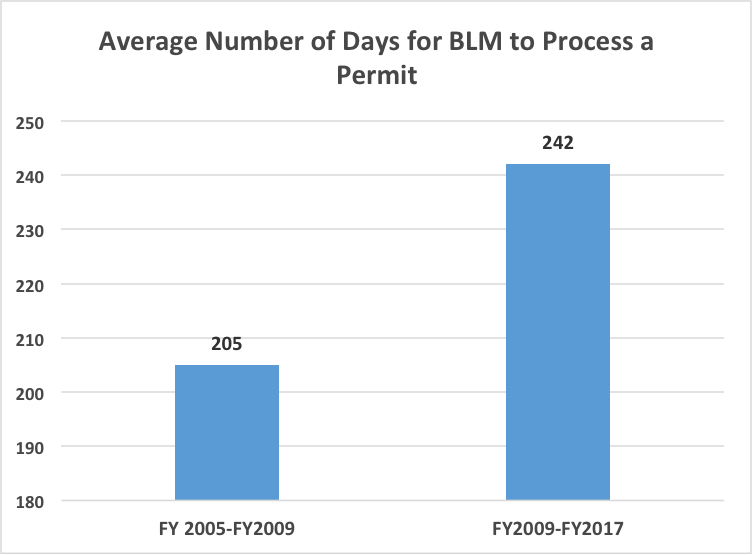 Since fiscal year 2011, the Bureau of Land Management has improved the time it takes to process a permit. But the average time during the Obama Administration was still 18-percent longer than the time it took to process a federal permit to drill during the five preceding fiscal years. In contrast, the process on private and state lands is relatively quick. State agencies process drilling permits on private lands, with some states approving permits within 10 business days. (In Texas, standard permits take approximately 4 days while expedited permits take 2 days.) On private lands, states allow some surface management issues to be negotiated between the oil producer and the individual land/mineral rights owner. To see the success of hydraulic fracturing and shale oil development on non-federal lands, one only needs to look at North Dakota, the second-largest oil producing state in the nation behind Texas. North Dakota has an unemployment rate of just 2.8 percent, lower than the 3.7 percent for the country as a whole. Most of the land in North Dakota is not controlled by the federal government. Besides taking an inordinately long time to process permits, the number of new leases on federal lands was down dramatically under the Obama Administration as the chart below shows. The average number of onshore leases that the Bureau of Land Management issued during the Obama Administration is 64-percent less than the average number issued by the Clinton Administration and 53-percent less than those issued by the Bush 43 Administration. In fiscal year 2016, only 520 leases were issued—3,226 fewer leases than were issued in fiscal year 2006. In fiscal year 2016, BLM issued the fewest number of leases since President Obama took office in 2009. There are numerous benefits to opening federal lands to oil, gas, and coal development. An IER study shows that opening federal lands and waters to exploration and production would increase federal tax revenue by $24 billion annually in the short run (over seven years) and $126 billion annually thereafter while state and local governments would receive $10 billion in tax revenue over the short run and $61 billion annually thereafter. Over 37 years, federal, state, and local tax revenues would increase to $3.9 trillion in federal revenues and $1.9 trillion in state and local revenues. Further, the economy would benefit by $127 billion annually over the short and $663 billion annually in the long run. Most impressively, the opening of federal lands could have a cumulative increase in economic activity of up to $20.7 trillion over a period of 37 years. And the ripple effect of that boom would be 552,000 in job gains annually over the short run with annual wage increases of up to $32 billion and an increase of 2.7 million jobs annually in the long run with annual wage increases of $163 billion. 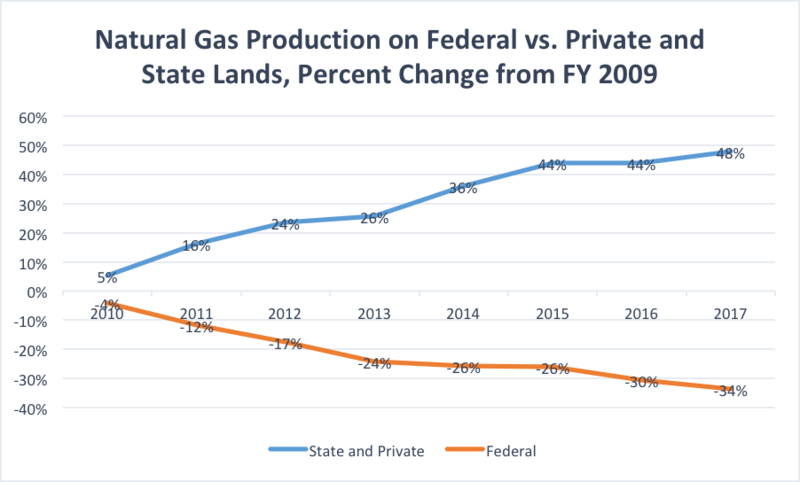 Oil and natural gas production on private and state lands is skyrocketing, while production on federal lands declined throughout most of the Obama Administration years. The Obama Administration offered less land for lease and took longer to process permits to drill than prior administrations. As a result of the red tape, oil and natural gas producers turned to private and state lands to make their investments and to produce affordable energy for American families. Increasing energy production of all kinds benefits consumers, the U.S. economy, and national security.